The fourth CGS Research Tour to the Allen County Public Library in Fort Wayne, Indiana, takes place August 16-23, 2009. Join CGS President Jane Lindsey for a week-long trip to the best public genealogy library in the United States. Whether you have visited before, or this is your first time, you will benefit from Jane's individualized attention to your research goals. Pre-planning meetings can be arranged by phone or in person prior to the trip. Space is limited to fifteen participants. To ensure the minimum tour requirement of ten participants is met, a $200 deposit is required by June 15, 2009. The trip will be canceled if we do not have the minimum, so please E-mail Jane Lindsey as soon as possible, if you are interested in attending. Download the tour brochure from the society website. The registration flier was also distributed in the January issue of the CGS News. 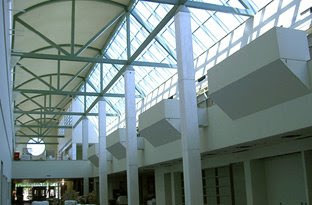 Photograph of the interior of the library is from the Allen County Public Library website.